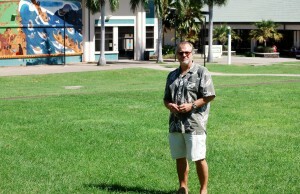 Timothy Botkin discusses UH Maui College’s sustainability future. 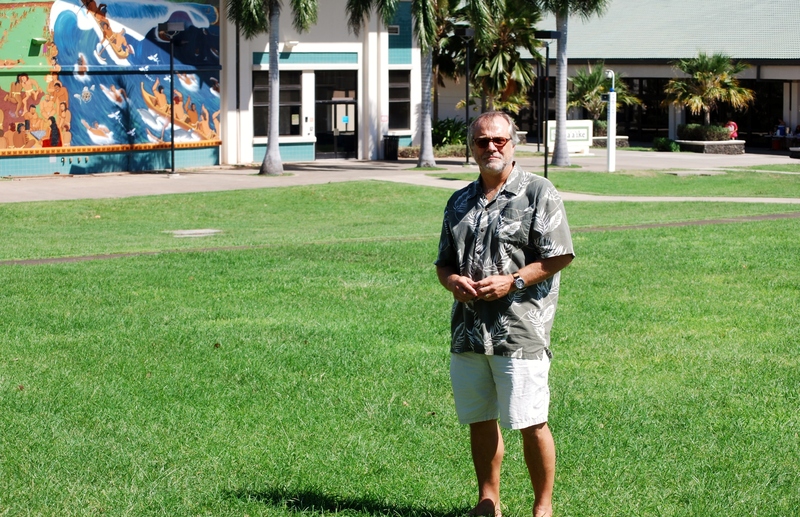 What started off as a career in environmental law was just the beginning for Timothy Botkin, the program coordinator of the Sustainability Science Management (SSM) program at UH Maui College. Botkin is also an instructor here on campus and this semester he is teaching five classes; Intro Science of Sustainability (SSM 101), SSM Internship (SSM 392V), Sustainable Systems Thinking (SSM 422) and the SSM Capstone courses (SSM 495, 496). Tim Botkin stands on the proposed site of the first “Sustainability Lens” project, which would feature landscaping, shading and composting. “It was evolution or progression that really got me into this world,” explained Botkin when discussing why he ultimately decided to start teaching full-time. After working in environmental law and realizing that his job was not about “hugging a tree or saving something,” but rather focusing on regulations and complying with laws, Botkin went a step further and became an administrative judge for environmental and land use. However, he said law began to feel a bit like a “box,” so he decided to go into public office for four years. Working there, he really got to see how things run together and rely on one another—as well as how difficult it can be to get things done. That is what led to his career in sustainability; he worked as a sustainability consultant before he taught at his local school for a brief period. Then, he decided that teaching was something he would like to do full-time. If you ask around campus, you might hear that Botkin has a very unique teaching style. “His teaching makes you use common sense,” said Breeze Santiago, a first-year student at UH Maui College and student in Botkin’s SSM 101 class. “The class promotes dynamic thinking and instead of focusing on just one subject… the class makes you think about how all things tie together,” she said. Botkin said he hopes that his teaching style causes his students to pause and think before jumping into an answer. “The science of sustainability is developing new means to allow us to actually think more carefully and broadly in the beginning, and then begin to organize those conversations,” he said. This appears to be the easy part of his job. Getting the campus on the path to sustainability seems to be the hard part. “We have a lot of work to do,” he said. Changing light bulbs or putting in energy efficient technology is okay, but according to Botkin, more questions need to be raised about the issues that can make the campus more sustainably progressive. So how is he going to get students to start asking the right questions? The “Sustainability Lens” is a new site that will allow students to see new or proposed sustainable projects on campus and offer their feedback. An email was recently sent out to students via “UH Maui Announcements” with a brief description of the website, and within just one day, Botkin said it had 41 responses. The first Sustainability Lens project covers landscaping, shading and composting. 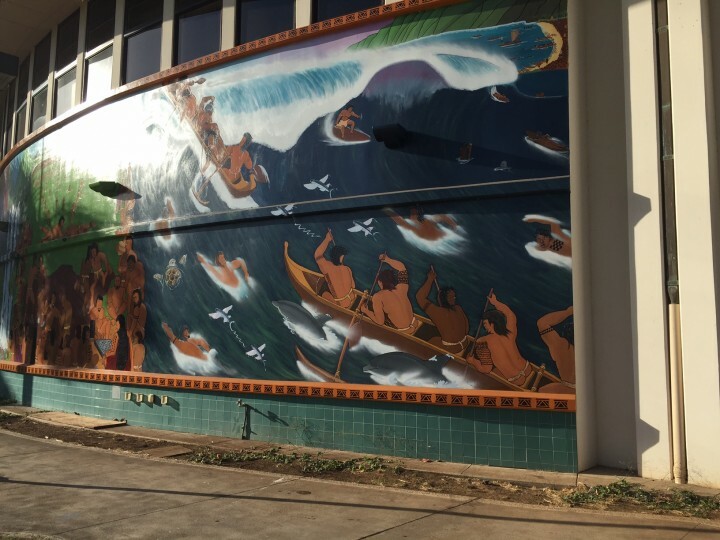 The proposed site for the new project will be on the lawn in front of the mural painting on the Ka‘a‘ike Building. So, while the PV (photovoltaic) out in the parking lot is nice, Botkin said there is more that can be done. He said that everyone seems to “get it” and he is happy with the responses he has received so far on the new site. Something students can look forward to at UH Maui College in the near future are the new short-term certificate programs in both sustainable tourism and sustainable technology. The decision to have short-term certificates was based on the students who wanted to go into Sustainability Science Management but didn’t want to get a four-year degree. Botkin said sometimes his students are interested in the “hands-on stuff,” (like green building and renewable energy) and want to be able to receive credit for the courses. “This is a way to create a cross-pollination between the two,” he said.